The expansion of the UCAP School on Broadway is on the City Plan Commission Agenda for this afternoon. I requested a copy of the Staff Report and it looks like a pretty good project. Service Road facade. Click image to enlarge. Of course, the devil as always is in the details, with this type of rendering it is difficult to tell what the materials are. However, at first look it is nice, doesn’t make one recoil in horror. There’s a short list of nitpicks as always: A rather blank wall along the Service Road. I won’t go on about saving the Engle Tire Building, but it is always annoying to not have a net gain on the vacant lot scoreboard. I’d prefer to see taller buildings along the Service Road, but there is still plenty of developable space. Broadway facade. Click image to enlarge. Site plan. Click image to enlarge. 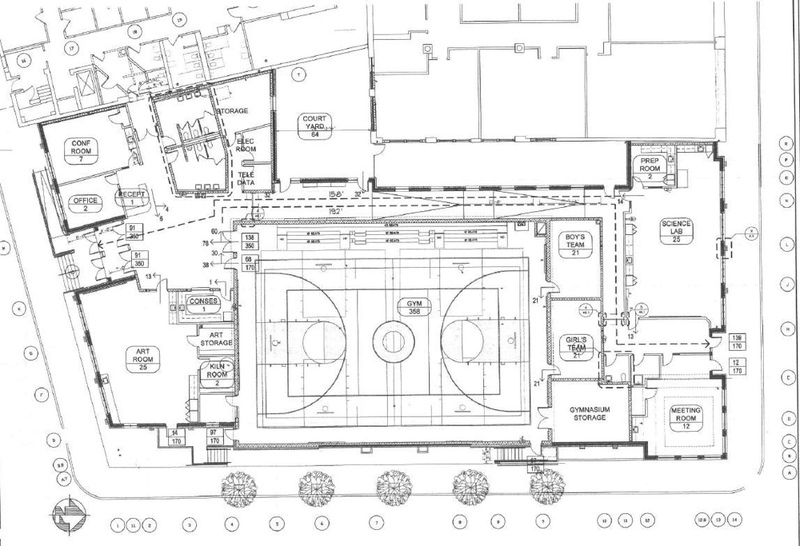 Some good things: The proposed building fits the lot, no surface parking (the school has surface parking off-site). There will be new trees added. A positive use (a school) replaces a less desired use (auto service). This is something that is on the radar of the Bike and Pedestrian Advisory Commission, but in this case, I feel it should have been common sense. As the Engle Tire Building is being demolished, and one could assume through the duration of construction, the sidewalks on site are simply closed. There is no sign further up Broadway at the closest available crosswalk warning pedestrians of this, there is no attempt to create a way for pedestrians to pass through, or safely cross at the closure. And along the Service Road it is especially egregious as that is the only sidewalk. 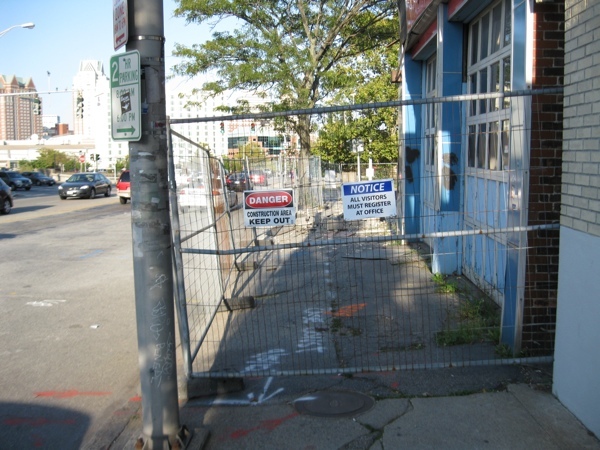 The closure of the Service Road sidewalk forces pedestrians to either scurry between the site fence and high-speed traffic on the Service Road, or endure a block long detour. The City does not require accommodations for pedestrians when sidewalks are closed, so no one provides any. It would be simple to require a barrier to allow for safe passage. The fact that this work is being done on behalf of a school in a school zone makes it disappointing that no attention was paid to this issue. The blatant disregard for pedestrians continues to be extremely frustrating. How hard would it have been to do something like this http://www.centralsubwayblog.com/blog/wp-content/uploads/2012/03/DSC_0060.jpg? Also, the building looks like a disappointingly generic rendering of an elementary school somewhere in the midwest circa 1985… I hope this isn’t the final design for such a prominent parcel of land. 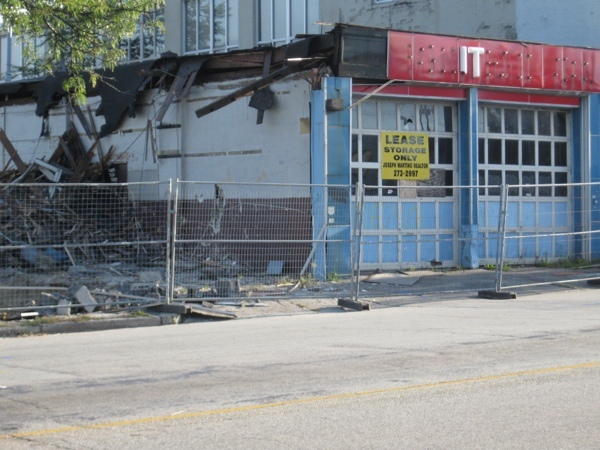 Another thing is the speed with which they tore down the Engle building. I left for Brain Tank 2012 at around 9AM and a guy was going around breaking all the glass on the building. I returned at noon and the building was down. Apparently they want to move quickly on this project. As director of development for UCAP, the school that is building this Annex, I can assure you that the design went through many iterations and was approved by the Providence Historic District Commission and the West Broadway Neighborhood Association. What does not appear in the renderings are the many trees we will plant along the service road on the 9′ deep sidewalk. Much more important in our eyes than the building itself, is the program opportunities that will accrue to our students – all of who, have been held back at least one grade and are therefore at high risk of dropping out. We keep our students engaged in productive activities well beyond traditional school hours.The gym, science lab, art studio and small meeting spaces will greatly enhance our ability to help our students get back on track. That said, we plan to add public art, attractive signage and, as noted above, greenery that will transform this gateway to the West End into an attractive and welcoming vista. We welcome visitors, and encourage people to help us build it, change a life, and donate! Even though there was an architect and a client, given the list of participants, this proposed building was effectively designed by committee. The service road elevation is not that bad, considering there’s a gym behind the wall. The more important elevations are first, Broadway and second, Carpenter Street. The Broadway elevation has a reasonable amount of windows, as well as good scale and proportion. The corner glass at Broadway and the service road should establish a strong presence for the building as a transition to the neighborhood. I would be curious to see the Carpenter Street elevation. I’m not a fan of postmodernism, but this is a decent design and it should be encouraged. As for the tall building issue, I agree that it would be better to load up the service road with tall buildings (or even deck over the Route 95 canyon filling with the same), but there’s always a tension between what the client or market demands are, as well as in this case adjacencies. This is a major problem with current zoning philosophy, because it’s restriction based, there’s often a sense of that a particular street or area is the last chance do something or if a low or small building is constructed, it’s considered as a waste of land. In contrast the 19th or early 20th century city evolved organically mostly without regulation and the only major restriction was technological. There was a sense of unlimited possibility. How can a regulatory balance be struck between the two extremes? I would have preferred creative re-use of the existing building, but this is a decent looking design and a million times better than other possibilities for the site (like a fastfood drive through or parking lot…) The school is a great asset for the community and this expansion seems like it will really improve their program. Oh I know, Dunkin Donuts was all about a drive thru there for a while. ArtInRuins has collection of photos from the Engle Tire & Providence Ignition buildings prior to their demolition on their Facebook page.